This page is a translated version of the page Lamy and the translation is 100% complete. Although Lamy, being born in 1930, appears to be one of the historic German producers, is often seen as a recently founded company. But since the '60s its models have always been characterized by the attention to design and design research, with the production of great value models like the Lamy 2000 that, for their futuristic and minimalist style, have earned the company an image of modernity and avant-garde. Having always invested in research and development, the company has been able to successfully overcome the crisis period following the ballpoint pen introduction, keeping up with the times and adapting to new market demands, on which it remained continuously present from its foundation. To date Lamy stands out as a manufacturer of midrange fountain pens, and writing tools for everyday use. Although the company has chosen not to produce luxury models, his fountain pens are excellent quality and maintain that particular attention to stylistic innovation that makes them always relevant and interesting. The Lamy was born at the hands of Joseph C. Lamy in 1930 in Heidelberg, under the name of "Orthos Fullhalterfabrik C. J. Lamy". Joseph C. Lamy had been director of the exports of Parker until the 20's. In 1927 he returned to Heidelberg as Parker Germany' general manager in the period in which it had acquired the Osmia for the Duofold production in Germany. At the end of 1929, more or less simultaneously with Osmia discharge by Parker , Joseph Lamy resigned to create his company. He moved to Berlin and began production of celluloid pens marked Orthos, very similar to Duofold (which at that time was much imitated) produced in two sizes and a wide range of colors. In 1933 Lamy acquired a first patent for a pen/pencil combination, and put into production a large pen, always meant to compete with the Duofold. There is little information on these years, and specific models are not known, the pens were simply marketed under the brand Orthos. A 1939 Artus Favorit advertisement. 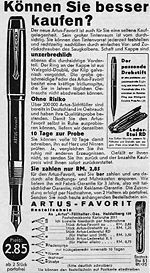 Also Joseph C. Lamy could foresee the times sensing the potential of plastic, and acquired the Artus Fullaltergesellschaft Kaufmann und Co., whose origins seem to date back to 1936/37, beginning, first in Europe, to produce plastic injection pens. The first model was made with a new patented piston filler mechanism, still marketed under the Artus brand while stood out clearly from predecessors. It is unclear whether the production of plastic pens began around 1939, approximate date of the acquisition of Artus, or only after the war. It is not clear even when it ceased to use the Orthos trademark, but at least until 1941  the brands coexisted sharing address and phone number, even during a change of venue took place in 1940. In subsequent years, the range was expanded with new models such as the Artus Rekord, Perfect, Favorit, Ballit, Schulüller, Prinz, Junior. The Artus concentrated in manufacturing economic and functional pens, with a focus on the student market; it also was capable to range over the whole field of the writing instruments. The company also stood out for the choice of a commercial diffusion based on direct sales by mail, bypassing the dealer network of stationery and supplies. In 1949 the Artus was renamed Artus, C. Josef Lamy, and the brand continued to exist until 1972. 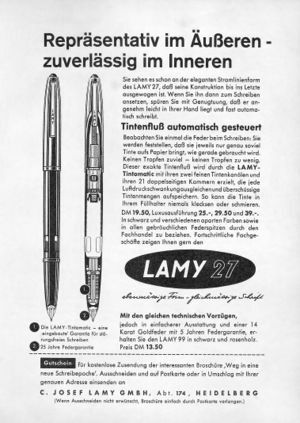 A 1958 Lamy 27 advertisement. Only in 1952 the company put on the market the first pen marked Lamy, the Lamy 27 model, with piston filler and demi-covered nib, tapered shapes with a style that is reminiscent of the Parker 51, which at that time saw countless imitators. Despite the similarity, the Lamy 27 was a pen with its own clear personality, and presented considerable technical innovation, like the particular feeder, referred to as Tintomatic, which is still used today for its characteristic to ensure a constant flow of ink despite changes in temperature and pressure, thanks to the micro inlays around the feed. In 1966 the company created what is considered its masterpiece, the Lamy 2000. For the realization of this pen the Lamy turned to Gerd A. Müller, a famous industrial designer who followed the Bauhaus stylistic movement for which the shape follows the function. The pen was made in Makrolon, a polycarbonate plastic resin reinforced with glass fibers, a revolutionary material for the epoch. Equipped with a piston filler the pen is considered one of the best examples of modern design for the simplicity of the lines and the functionality of the realization. In the following years Lamy has always maintained a constant style research and made functional and robust pens. Without pointing to the exclusive luxury market (with prohibitive cost), but also without ever falling into disposable objects culture produced at minimum cost (and value) possible, Lamy managed to stay in the writing tools business thanks to its ability to create modern design and high quality construction fountain pens, and now appears to be the leading German manufacturer of writing instruments. ↑ at least as reported in this discussion. This page was last edited on 9 September 2017, at 02:18.